For most, sports video games offer the chance to create the player they wish they could be and live out a career full of tense, adrenaline-riddled moments and clutch plays. It’s fair to say that the Out of the Park Baseball series offers a different kind of tension. A management simulator, the game allows players to be a manager, general manager or commissioner for baseball teams in the major leagues, minor leagues or a few international and American independent leagues. They can set lineups, make trades, scout players and attempt to build a team for the present or the future over the course of as many seasons as they’re willing to play. It’s a lot of spreadsheets — and it’s glorious. It’s like Baseball-Reference: The Video Game, or a fantasy baseball league that doesn’t stop being fun when 80% of the league stops playing and the rest make offensively bad trade proposals (no, I’m not trading Jose Altuve for Aaron Hill). In our case, we’ll use the game as a testing ground to run a few experiments and see what new information we can glean about last year’s team and the inner workings of this heartless, number-crunching baseball simulation machine. We’ll use Out of the Park Baseball 17, which begins before the 2016 season. The first thing I’ll do is run a few seasons where I don’t participate at all; I’ll leave Matt Klentak in charge, just as I choose to do in real life. This will give us a sense of what the game expected of the Phillies last year so we can see how close it is to reality — or if it gives us a sense of what “should have” happened, implying the real Phillies were playing above or below their true talent level. After that, I want to see how the team would have fared if it had immediately called up its best prospects, satisfying the philosophy (read: fantasy) some fans have that a bad team might as well just call up everybody. Finally, I’ll go full Willy Wonka on this thing and run whatever experiments satisfy my lunatic desires. You’ll see. You’ll all see. Okay, let’s get the boring stuff out of the way. Player rankings really hate the Phillies— but better days are ahead. 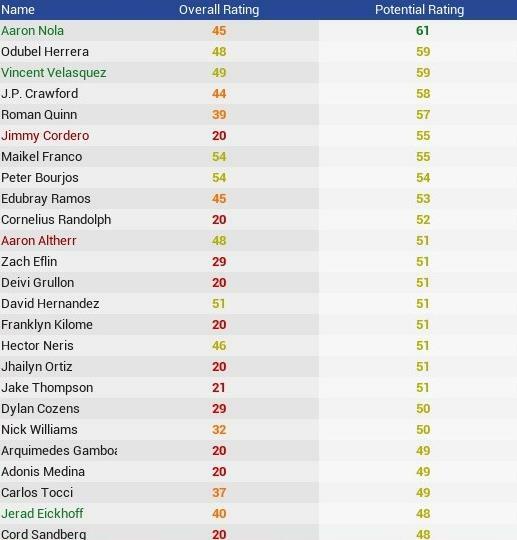 OOTP rates players on the same 20-80 scale used by scouts and player evaluators. On that scale, a 50 grade means an average player, 60 means “plus,” 40 means well below average, etc. Also on that scale, Out of the Park gives the Phillies only three players average or above average ratings: Maikel Franco, Peter Bourjos and David Hernandez. A few other players came close, including Vince(nt) Velasquez, Aaron Altherr and Odubel Herrera. Even in real life, not every prospect – even the ones everyone hears about for years – is necessarily expected to be a superstar in the end. In many cases, a future as a league-average regular is all it takes to get eyes on a prospect. This is the category the game would lump most of the Phillies’ prospects into, at least before the 2016 season: only Nola, Herrera, Velasquez, Crawford and Quinn have potential above 55, while a lot of the others are projected to end up as a pretty average major leaguer. While worth mentioning because it suggests we shouldn’t expect a horde of absolute superstars joining the team in the coming years, it’s not necessarily a bad look. Stocking up on enough completely average players is a good starting point for a team; it makes for a well-rounded club that would only take a few key free agent signings or over-performers to become a very good team. The first step in our experiment is to let the game play itself without any intervention at all. This way we can quantify its expectations for the 2016 Phillies and set a baseline. We can see how far off the game is from what really happened or, again, what “should have” happened, and see if it thinks things would have been better or worse in the various scenarios we subject it to later. Obviously, running a single season isn’t enough because of the random variation and fluctuations that can happen. The simulation takes a while to run a full season, so I’ve limited the sample size to five seasons. In five seasons, the Phillies averaged a dreadful record of 64-98. They won as few as 53 (53!) games and as many as 72 along the way; interestingly, that 72-win season was the only time they tied or beat their real-world 2016 record. This suggests one of two things: either the game is just down on the Phillies (which is supported by, for example, Odubel Herrera being ranked worse than Will Venable at the end of one season), or the Phillies outperformed their true talent or on-paper ability in 2016. Hear me out, those of you saying only an idiot would question what happened in actual, real-life baseball based on a video game. The Phillies’ Pythagorean win-loss expectancy, which is based on run differential, suggests the Phillies “should have” been 62-100, which is only 2 games off from what OOTP simulated. Pre-season PECOTA projections had the Phillies at 65-97. Of those four possibilities, especially when considering that the Phillies had the worst offense in baseball, 71 wins sounds like the outlier. On average, the game also had the Phillies scoring 20 fewer runs and allowing 22 fewer than they actually did. This can be explained as an imperfection in the game’s run-scoring environment; every team I checked in the standings had numbers off by about the same amount. How those outcomes ranked the Phillies with respect to their National League opponents was closer to reality: they averaged 13.4th place out of 15 NL teams in the game in runs allowed and were 12th in real life; the game had them at 13.2nd place in runs scored while the real team was a league-worst 15th. It’s not spot on, but it’s not off by much. I did five trials to average out the record and pitching and hitting results of the team, but I had to look at individual seasons to find some real bizarro-level stuff. I picked a 68-94 season (because it’s in between the team’s real world results and Pythagorean record) and went digging. It didn’t take long for things to get weird. I wanted to see if the game could, by some sorcery, predict that Freddy Galvis would hit 20 bombs in 2016, but something was missing: Freddy Galvis. Galvis only played in two big-league games and was demoted to Lehigh Valley to make room for J.P. Crawford. Promoting Crawford is great, and the game believes in him – he was worth between 1-2 WAR in about a half season every time the game promoted him – but demoting a versatile and sure-handed fielder like Galvis is nonsense. If nothing else, he could back up Franco at third base and fill in at second for Cesar Hern— wait, why was Odubel Herrera moved back to second base? Despite having more viable infielders than outfielders and Herrera being the lone sure thing in an outfield that included Cody Asche, Tyler Goeddel, Peter Bourjos and Aaron Altherr, the game, in its limitless computational wisdom, moved Herrera back to a position he hasn’t played with the Phillies: second base. Cesar Hernandez, whose on-base percentage was 80 points higher than Altherr’s, was relegated to a bench role to accommodate the move. Jerad Eickhoff was bumped from the rotation by Hoby Milner despite being the team’s most consistent starter in real life and despite Milner not being a starter at all. In the real world, the Phillies recently lost Milner in the Rule 5 Draft. This means that, while he may have a plausible role in someone’s bullpen, he’s also someone the team chose not to protect with a spot on the 40-man roster. They could have removed Severino Gonzalez or Luis Garcia, for example, to make room for him, but chose not to. And, in the digital dugout, he took Eickhoff’s place. It’s worth noting that, in all five seasons, Klentak didn’t make any particular transactions worth mentioning. He stuck mostly to waiver claims and attempted modest free agent signings of players like Justin Morneau. Most players refused to sign because the money being offered was too little for them, though a few commented that the team simply wasn’t one they wanted to play for — they were just that bad. Sorry, Phillies. I’d play for you. Next time, we’ll get into the fun stuff, starting with putting the kids in charge.